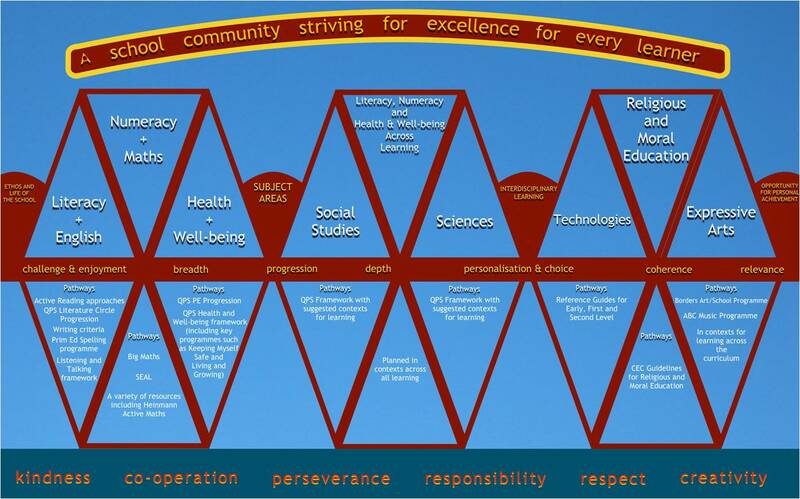 Curriculum for Excellence Curriculum for Excellence (CfE) aims to achieve a transformation in education in Scotland by providing a coherent, more flexible and enriched curriculum from 3 to 18. You can find more information about the curriculum from the Education Scotland’s Website where you can also access and download various Education Scotland Leaflets. Click the picture for a larger view of our Curriculum Map. It shares how we currently assess children’s progress and how standardised assessments play a part in this. Teachers are constantly assessing how well your child is doing in their learning – and in many, many ways – including through marking every day, creating assessments which take a closer look at key learning, observing, and talking to your child. A change from August 2017, is that the Sottish Government is introducing new national standardised assessments covering some aspects of reading, writing and working with numbers. Every child in P1, P4, P7 and S3 will take these assessments online.